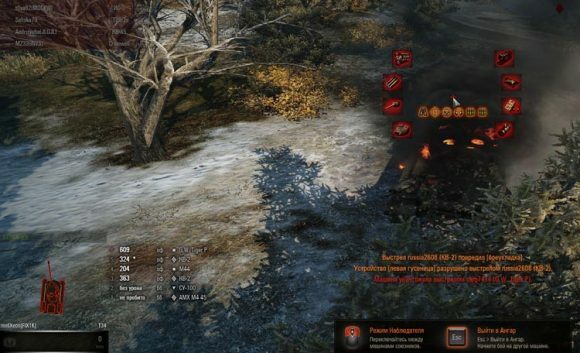 Mod damage panel from KobkaG for WOT 1.0.2 is a joint creation of two authors – GambitER + KobkaG with the movement of the tank’s strength panel in the center of the screen and the ability to heal the crew and repair the modules via CTRL + left mouse button. The panel was completely redesigned from scratch. Thanks to this, instead of just a log of the received damage, an extended one was added to the panel. Who does not like the panel of damages from Zayaz, but want to repair the center, then this panel is for you. This mod shows the type of gun, time of its recharging. Such data in battle – is very important. But there is another useful function for this modification. If the player’s tank is “downed by the tracks”, then the icon does not light up as in the usual lower left corner, but in the diameter from the sight. And the repair time timer counts down immediately. All information about the technique before your eyes. Nothing is distracting from the process of sending enemy equipment to the dump. Mini version of the panel. Especially for people who play on laptops or on small monitors, the author made a mini version of this panel. It decreased and-for the cleaned tank, so the chat fell down. The panel looks very cool. Where do I install the font?? ?